"With the production of single pieces and small series, there is still a great deal of potential today that is going to waste at the moment", says Stefan Maas, owner of Maas Frästechnik. Primarily when it comes to choosing the clamping devices, there is a great deal of potential that is not being used in his opinion. 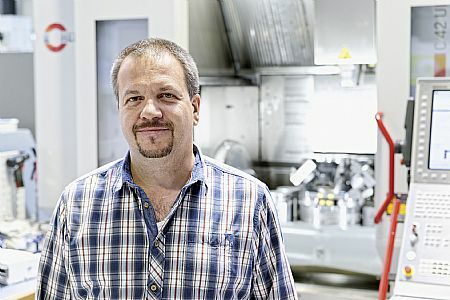 Together with Martin Schultheis from Qmax Plus Tooling + Engineering and SCHUNK, he has successively trimmed his own operation to maximize productivity. Stefan Maas is a doer through and through. Sitting still is simply not his thing. His gaze permanently detects where there is a need for action and where potential for optimization lies. He began two years ago with a single milling machine and expanded his operations over the past two years from 12 to 32 employees today. The fact that Maas was never satisfied with the current status quo led to a close collaboration with Martin Schultheis from Qmax Plus Tooling + Engineering, a supplier claiming to specialize on the optimization of metal cutting processes. The two are constantly fiddling about with processes – their own and with those that are developed on behalf of their customers. They tinker with the programming, the tools and the clamping devices until the maximum level of productivity has been reached and sophisticated processes have been implemented into their own operations or can be handed over to the customers ready to go. Here, the production of Maas also serves as a showroom and training center, because some of the strategies that the company has successfully established over the past few years can be used as blueprints for the customers' processes. The best example: The equipment of three 5-axis machines with a consistent clamping solution from SCHUNK, the competence leader for gripping systems and clamping technology. Martin Schultheis received the impetus for this with a 5-axis machine he had procured for the development of customer processes. It was equipped with SCHUNK VERO-S quick-change clamping modules and operated in Stefan Maas's production facility. "We always considered using quick-change clamping technology in single-item production. But it was always a case of if we didn't make a start, nothing would happen", Stefan Maas recounts. Within a brief period of time, the tables turned: In daily operation side by side with conventional clamping devices, it became clear how great the advantages of the quick-change clamping system were. While the conventionally equipped 5-axis milling machine, which for a long time was the bottleneck on the Maas production line, would have to be laboriously retrofitted, the DMU 50 ecoline from DMG Mori had long since been up and running again. For Stefan Maas, this was a clear signal: if they were to invest in a new 5-axis center, then only with the quick-change pallet system and a consistent clamping technology concept. 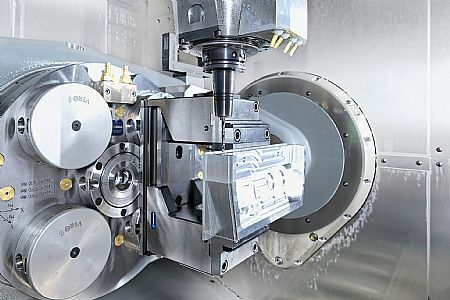 They were right: Besides the DMU 50, today one Hermle C30 U and one Hermle C42 U machining center are equipped with the SCHUNK quick-change technology and supplemented with an extensive clamping device pool, meaning the majority of all conceivable customer requests can be covered straight away. "We have components in the size of a little finger and others are equipped with a 500 mm base plate. This means we are required to map all possibilities in very quick succession and must often put out fires for our customers," Stefan Maas explains. "If a vise with six clamping claws has to be clamped up and down every time, it is too time-intensive, because the customer does not pay for the setting up." The key element of the clamping solution are SCHUNK VERO-S NSE plus 138 quick-change modules, with which all machine tables are fitted in a consistent gauge for boreholes of 200 mm. This allows various clamping devices to be switched between the individual machines with just a few actions. "I don't need to tighten any screws, look for any washers or keys. All clamping devices are precisely and firmly connected to the machine. The clamping situation is always identical, without anything having to be aligned. And the flexibility is simply sensational", Stefan Maas enthuses. Radially arranged clamping slides retract and self-lock the clamping pin with the SCHUNK VERO-S via a spring assembly that uses form-fitting clamping. Clamping and positioning is carried out via a short taper, which ensures a repeat accuracy of < 0.005 mm. Due to patented dual stroke system, each module achieves pull-down forces of 7,500 N. With activated turbo-function, the proven pull-down force is 25,000 N. The retention force is 50,000 N. Due to the special geometry of the SCHUNK VERO-S clamping pins, an eccentric and therefore particularly simple loading of the modules is also possible without the clamping pins being tilted. In order to increase service life and process reliability, all functional components of the VERO-S modules are made of hardened stainless steel, making them absolutely corrosion resistant. In addition to this, the modules are completely sealed and thus protected against contaminants and coolant. Maas makes particular use of the clamping pyramids from the more than 1.000 variants of the modular SCHUNK VERO-S system. "If you want to reach all sides during 5-axis machining, then you can essentially only clamp over the middle. As soon as I clamp two components next to one another, there is always one component disturbing on one side", Stefan Maas explains. The SCHUNK VERO-S clamping pyramids compensate precisely this disadvantage: "I am relatively free when it comes to accessibility and can turn the vises depending on the situation around 90° for instance. So I have a multiple clamping system and use the advantages of multi-side machining at the same time." This allowed several parts to be machined one after the other, without user intervention being necessary. At the same time, the times for tool change are reduced, as four parts can always be machined one after the other with one and the same tool. "With the pyramid, it is irrelevant whether I machine four identical parts in series or four individual parts, because I can bundle similar individual parts together on the pyramid at any time", Stefan Maas explains. The only requirement is the programming in the CAD/CAM system and a reliable simulation. His idea goes one step further: "My vision is to have four different zero points on the pyramid one day, and to be able to machine completely different components." The VERO-S clamping pyramids are combined with manually actuated SCHUNK KONTEC KSC 125 clamping force blocks, in the lengths 160 mm and 300 mm. The highly efficient all-rounders for raw and finished part machining combine high clamping forces, convenient operation, and short set-up times. With comparably low torques, I can achieve high clamping forces of 35 kN, meaning I can completely do without a separate stamping station for form-fit clamping. As the clamping takes place under tension, the bending load on the base body and thereby the lifting up of the clamping vise are minimized, which adds to the accuracy and rigidity of the clamping. A pre-tensioned center bearing without spindle reverse clearance and specially adjusted slides ensure an excellent repeat accuracy of +/- 0.015 mm. The fully encapsulated drive and an integrated chip outlet ensure particularly high process stability and minimum wear. Due to a jaw quick-change system, workpiece-specific chuck jaws can be changed in next to no time and a wide range of workpieces can be covered. From Martin Schultheis' point of view, the KSC is the ideal vise for the job: "The KSC builds very flat on the pyramid and is highly compatible with the quick-change system for the first and second clamping. What is more, it ensures a high level of precision. And a wide range of materials and machining can be achieved using the SCHUNK jaw range", Schultheis continues. For urgent orders that Stefan Maas always has to carry out here and there, the clamping pyramid is exchanged on the spot. This allows parts of up to 800 mm in length to be machined in SCHUNK KONTEC KSC vises directly on the machine table. Alternatively, cylindrical or flat components can be clamped using the SCHUNK collet chuck mounting or the SCHUNK SPM clamping fixture on the fifth side of the pyramid. "We are a classic single-item production line, where it is essential to be extremely flexible on the machine. It doesn’t help me if I have a Mercedes and equip it with wheelbarrow tires", Maas highlights. 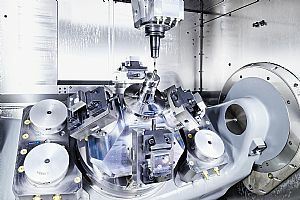 Particularly in terms of clamping technology, both he and Martin Schultheis see significant potentials in a number of operations: "The success in machining will rest on three pillars in the future: CAD/CAM programming, the standardization of tools, and the standardization of clamping technology. Above all when it comes to clamping technology, there is still a great deal of potential", says Martin Schultheis. "It is not a case of turning the hamster wheel faster and faster, because the possibilities of the tools have largely been exhausted." 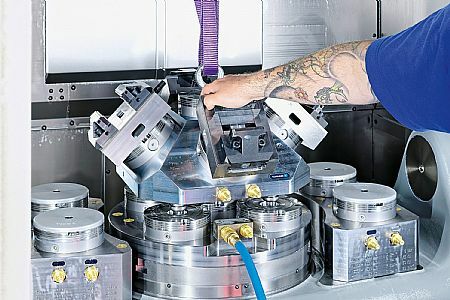 It is much more efficient to use current clamping technologies like those from SCHUNK intelligently, even if they require a slightly higher investment at the outset. "We have the most modern machines which bring precisely that which is simultaneously available on the market in a 5-axis machine. We have completely achieved the maximum tool rack and the standardization of the tools. We have mastered the SCHUNK quick-change system and a pyramid to achieve multiple clamping and fully use the machine room. We have hereby achieved the maximum", Martin Schultheis summarizes. "The fact is that most of this investment will have paid for itself within a year, maybe even less."